What happens when you write a book about a HipHop-KungFu Master Super-Hero from NYC, then organize a team of artists from New York City, Mexico, El Salvador, Argentina and Philippines to re-create the book in Comic Book format, without any dialogs whatsoever and backed by a mixtape? You get MASTERNEVER. Hip-hop’s first superhero is about to unfold in the comic community. 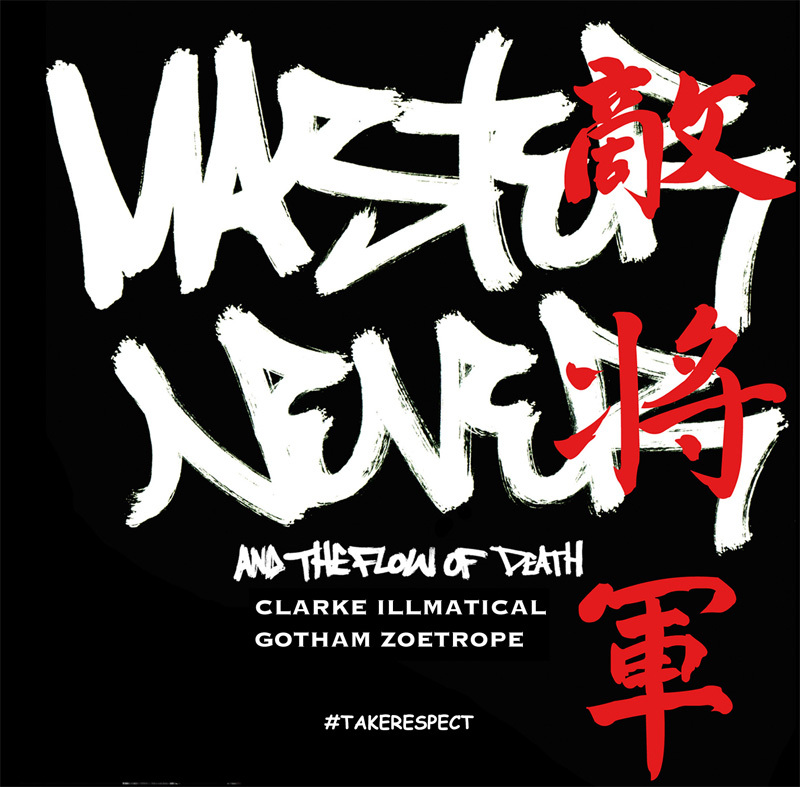 Masternever and The Flow of Death by Clarke Illmatical and Gotham Zoetrepe is the first peer to peer made comic book ever featured on a p2p network. As stated on the website the comic is about Arious Alcide, a young martial arts master living in Chinatown, New York, who has been given the task of adding his fighting style to a 2,000-year-old Chinese legacy, known as The Never Ending Masters. In order to do so, he must decipher an ancient document written in a mystical form of graffiti known as the Forgotten Hand. As he sets out on his quest to find the legendary writer who created the document, he is confronted by a Triad family, a sorcerer, and several Kung Fu masters who want to defeat him. Included in the download are some articles about the people who were the creators’ inspiration behind the project – the Taoist martial artist Novel Bell and the NY graffiti artist JESUS SAVES. Scrolling through the pages, you will realize that this is not your ordinary comic book. The first chapter welcomes you with pages of visuals over visuals but without any dialogue. It’s because the comic is intended to be read with a provided mixtape/soundtrack, which is included with this very download. Now, how brilliant could that be? It is not new for a comic book to lack letters, but to accompany it with another form of media makes this one a one-of-a-kind gem. It will surely elevate the overall reading experience. Visually, the illustrations are spot on. The use of neat and geometric layout makes it more accessible for first time readers. I personally like the Chinatown setting as it gives the story more colour and substance. All in all, Masternever and The Flow of Death is a breakthrough masterpiece that’s not afraid to go outside the box. The exploration on such different medium is what makes it something to be anticipated issue after issue. It was not an easy road for this work to surface. But the creators’ perseverance and belief on the story made it all possible. And for that, I give this comic nothing but respect. I had the opportunity to attend the NYC ComicCon 2011 last year and I couldn’t resist stopping at the MasterNever booth when I saw the beautiful Kung Fu + Hip Hop + Black/White illustrations, luckily Clarke Nigel aka “Illmatic” (creator, writer and director) was there at the booth and I had a chance to tell him how we support independent content creators here on FrostClick and on FrostWire. To my surprise Clarke told me that the book was actually a peer to peer project as well, that every Chapter of the book was illustrated by different artists that collaborated from all over the world, not only that, the Comic Book was meant to be enjoyed alonside a hip-hop mixtape… I knew right there we had to share this with the world. After a very long year of back and forth (and a long queue of FrostWire promotions) we finally put together a Creative Commons licensed bundle with the first Chapter of MasterNever for you to share and enjoy. It’s packaged in the form of an eZine, it comes in .CBR format for those of you who already read comic books on electronic devices, or in PDF if you don’t want to install special software. Chapter 1 will take you to contemporary New York city, more specifically to Chinatown, where some Asian Mafia vs Kickass-BaddAss-Kungfu-Misterious-Legendary Super hero (with an ego reminiscent of old Kung-fu master characters from old chinese movies) action is about to take place. At the end of the chapter I wanted to know more and I’m sure so will you. We need all the feedback we can get from you guys, below I’ll leave contact links for you to reach out to the MasterNever team, if you guys love this we think we can convince Clarke to release more episodes for free. If you want to get physical copies of the book head to the official website and support these talented artists by getting yourself a copy of the first Comic Book ever to be featured on FrostWire.